Brain Scans Reveal that Processed Foods ARE Addictive...Again! Brain Scans Reveal that Processed Foods ARE Addictive…Again! 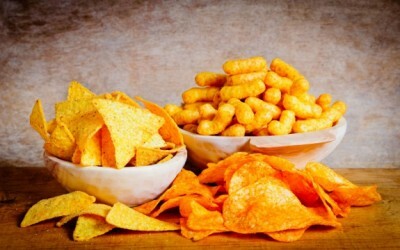 Convenient, conventional snack foods—there’s a reason one chip maker says, “Bet you can’t eat just one!” And that reason has nothing to do with you getting nutritional value from these snacks, but rather not getting value from them at all. These highly processed carbohydrates (including sugar and high fructose corn syrup) are addictive, plain and simple. And a recent study offers additional evidence to prove it. The study was conducted at Boston Children’s Hospital, where patients were given a meal of either low glycemic index foods or those with a high glycemic index (quickly digesting carbs like sugar and white starches). Then, the researchers analyzed what went on in the brain after these meals. This means the brain scans affirmed what many have suspected for a long time—that highly processed simple carbohydrates lead to brief increased energy levels (through increased blood sugar), followed by a “crash”, and then by a craving for more. In other words, the brains demonstrated the cycle common in addictive substances. The study came to similar conclusions as past research finding that processed foods could actually be addictive as cocaine. The addictive nature of these over-consumed foods could certainly be having a profound effect on the growing obesity rate. While the American Medical Association would have you think the “disease” of obesity is one treatable with prescription drugs and even vaccines, they are missing the fact that simply changing the addictive cycle of today’s processed foods could ultimately help someone reach optimal health and “cure” their obesity. There are several ways you can stop the addictive cycle. Of course, eliminating as much sugar and processed carbs as possible is a good start. But, adding black coffee (which can block opioid receptors) and exercise to your daily routine can help you fight the urges to indulge. No shockeroo here! I definitely agree with this assessment. If you kick this crap, you're fine. But even if you think about (let alone see or smell) stuff later, it's right back in your face. Like kicking alcohol addiction. It's in your face every day. I've kicked it several times for months or even a year. One small lapse and it starts all over again. It's dangerous, and that's exactly the way that mainstream wants it!